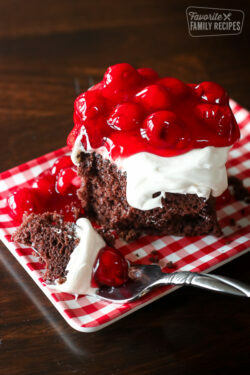 This Easy Chocolate Cake with Cherry Topping recipe is as simple to make as it is tasty. With only 5 ingredients, it whips up in no time at all. Bake cake mix according to directions, then cool. Mix cream cheese, powdered suger, and cool whip until smooth, then spread over cake. Just before serving, top individual slices with cherry topping.